Reece died 2nd June 2007. 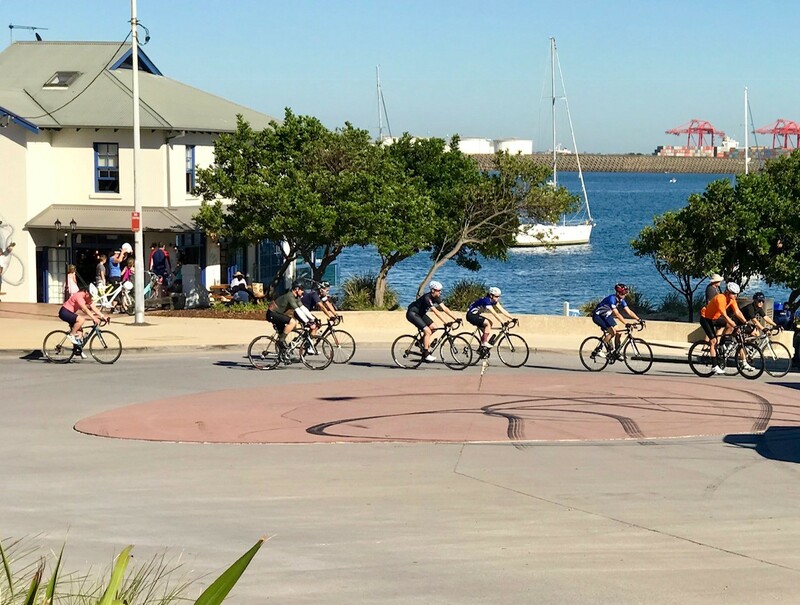 It was perfect weather for celebrations with early morning cyclists around the loop and sailors in Frenchman’s Bay. 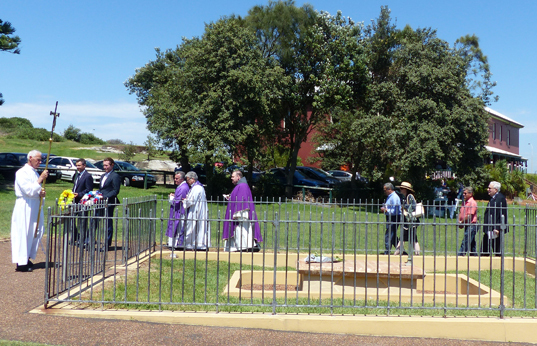 The Receveur Mass organised by Lee Leo of St Andrews, Malabar, was held at 11am with about 210 followers in attendance. Father David Blowey OFM CONV was the Principal Celebrant. 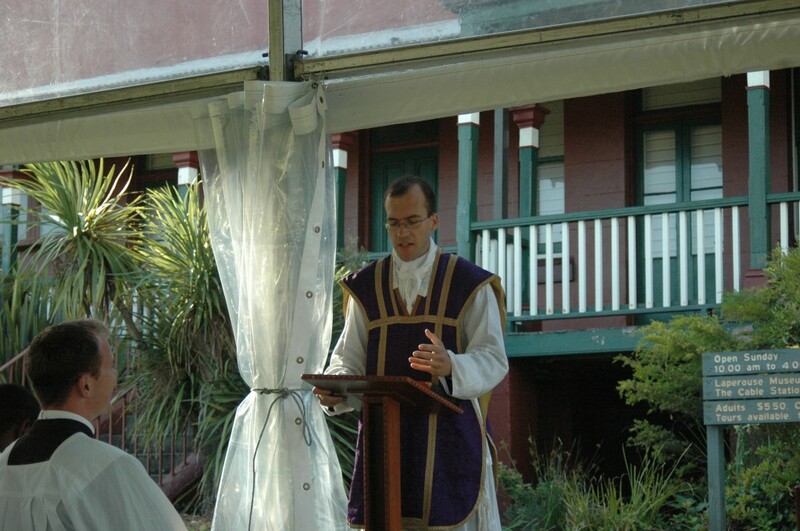 Father Blowey is the Provincial Delegate Order of Friars Minor Conventual, Greyfriars Australia. Co-celebrating were Fr Laurie Cauchi from St Andrews, Fr Willis Melderea, Chaplain to the Francophone Catholic Community, Father Martin Mai OFM Conv and Fr. Leonard Testa OFM Conv. 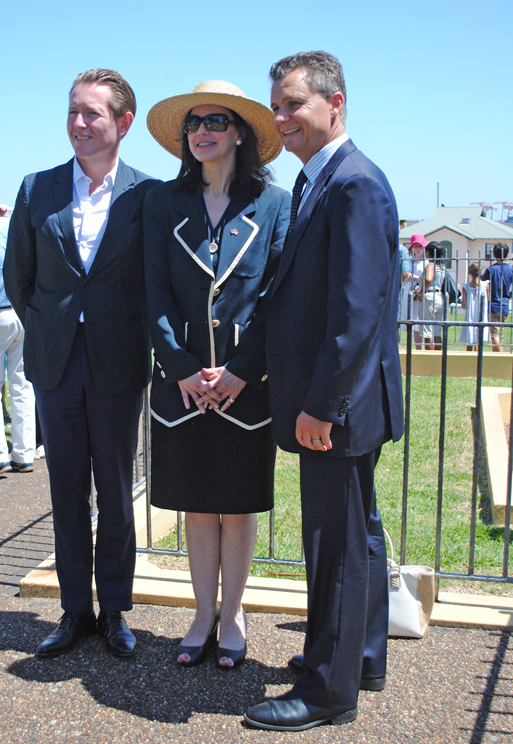 Special guests in attendance included Mr Nicolas Croizer, French Consul-General, Federal MP, Hon. Matt Thistlethwaite, and Councillors Danny Said, Carlos da Rocha and Noel Da Souza. 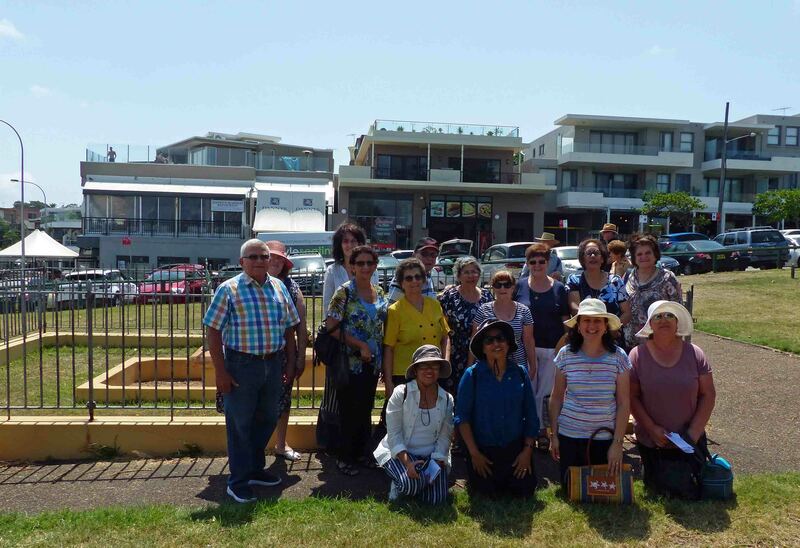 The Sydney Seaside Lions provided the sausage sizzle and Friends of the Laperouse Museum refreshments. 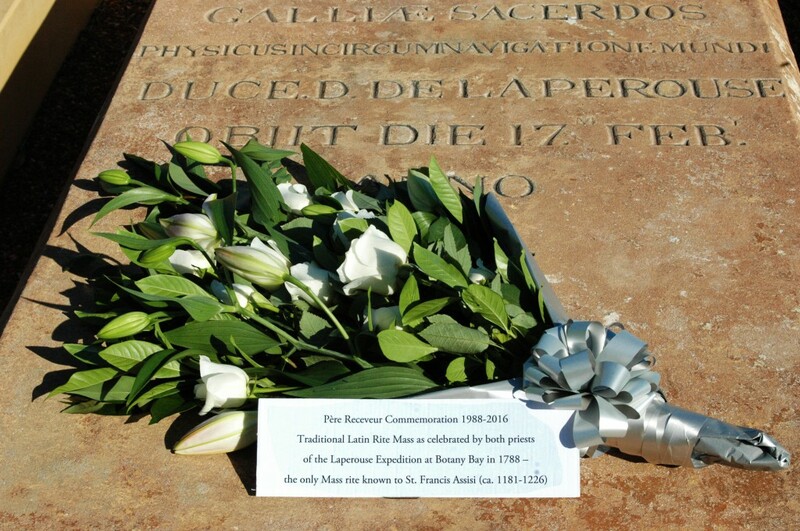 As advertised this continuous annual event occurred on 17th February, the actual anniversary of the Conventual Franciscan friar’s death in 1788. 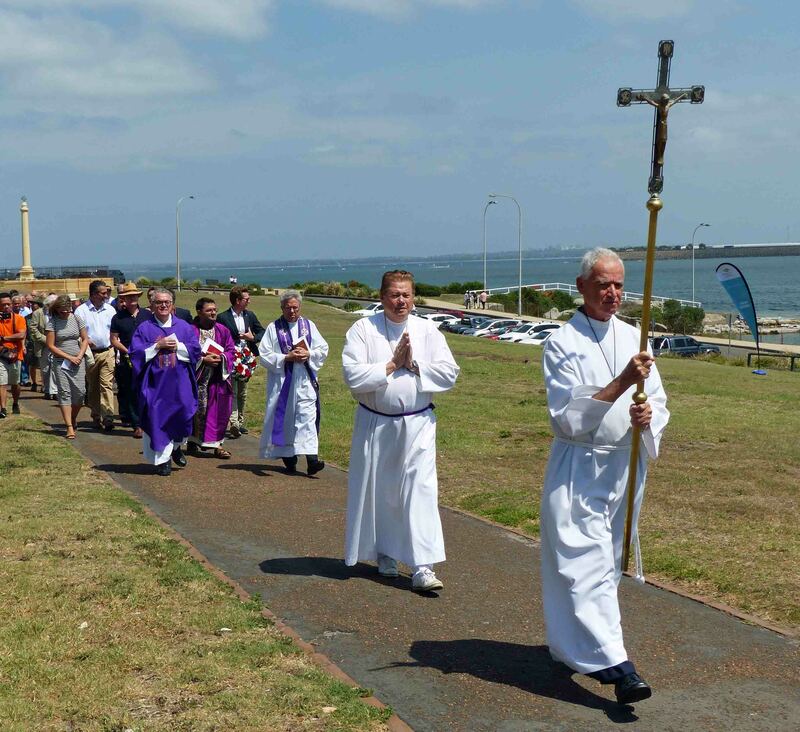 Mass was celebrated AT 8AM in the ancient traditional Latin rite used by the two priests of the Laperouse Expedition at Botany Bay in early 1788. 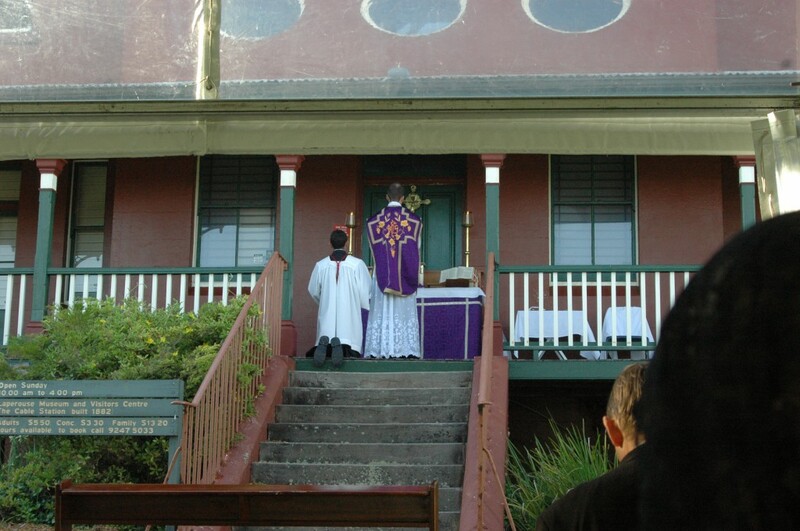 Father Eric Ladner SSPX said the Mass on the verandah of the Laperouse Museum and preached the occasional sermon on the inception of the Mass in Australia by the priests of the Laperouse Expedition.. 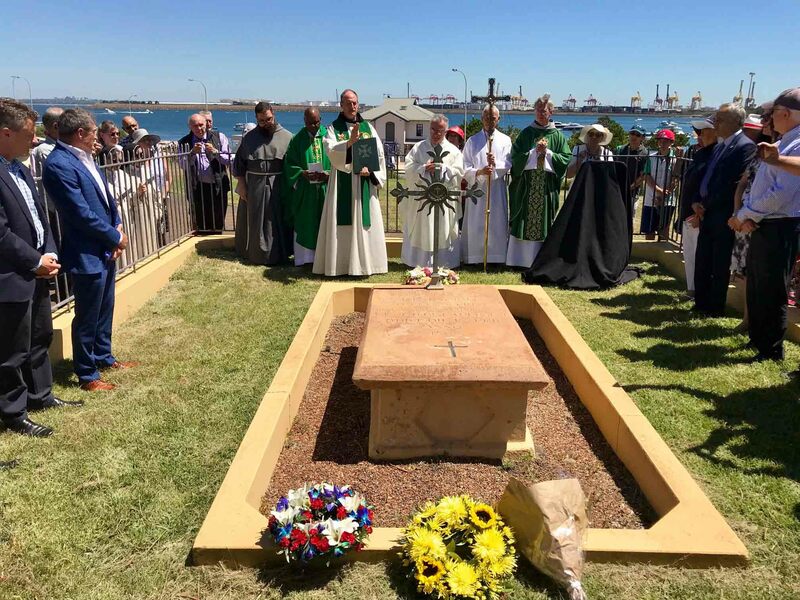 The Mass was followed by a procession of priest and congregation chanting the In Paradisum to the grave for final prayers for the dead and the chanting of the Salve Regina. 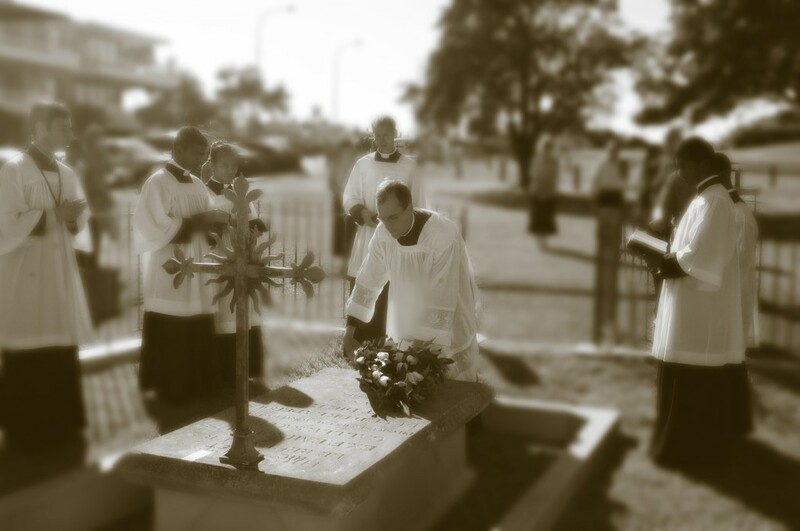 The grave on which a wreath had been placed was aspersed with holy water by Father Ladner. 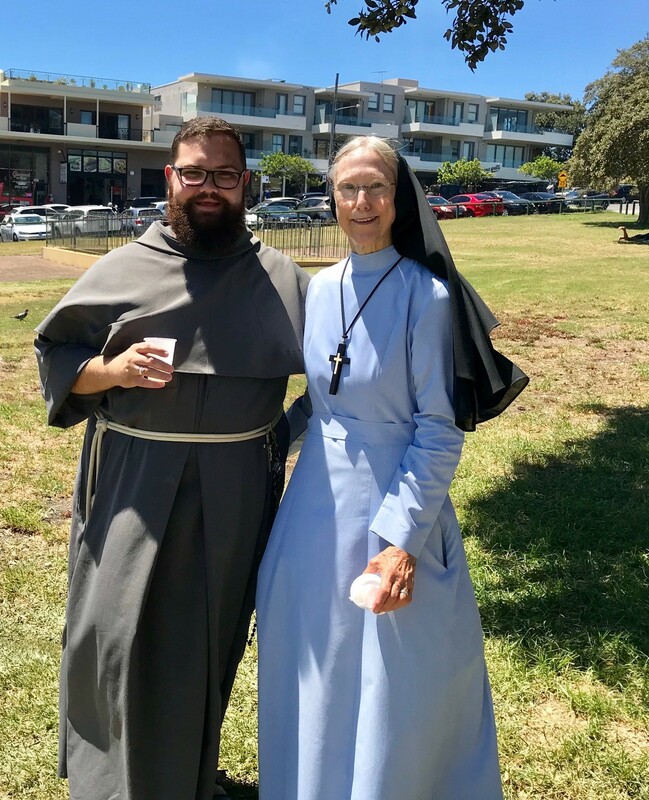 The congregation of some 130 people included 6 Sisters of St. Pius X.
Sunday, 17th February, 2019 at 8am. 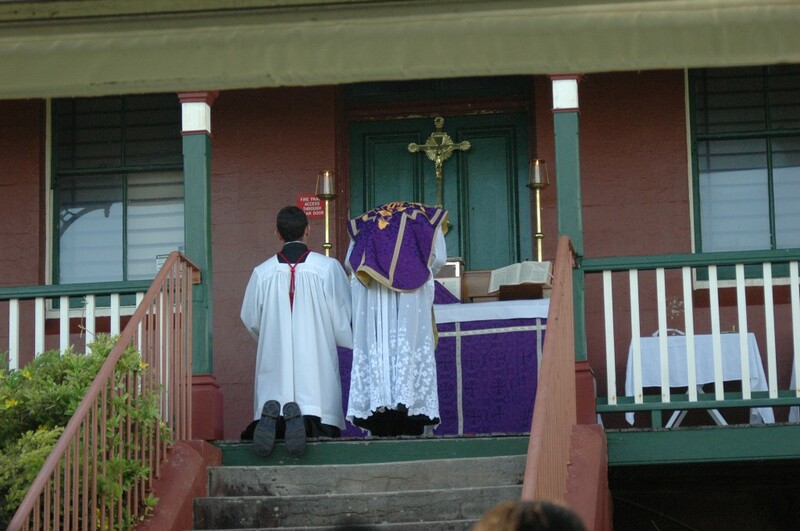 Mass in the traditional Latin rite of the Catholic Church that was used at Botany by the two priests of the Laperouse Expedition at Botany in early 1788. 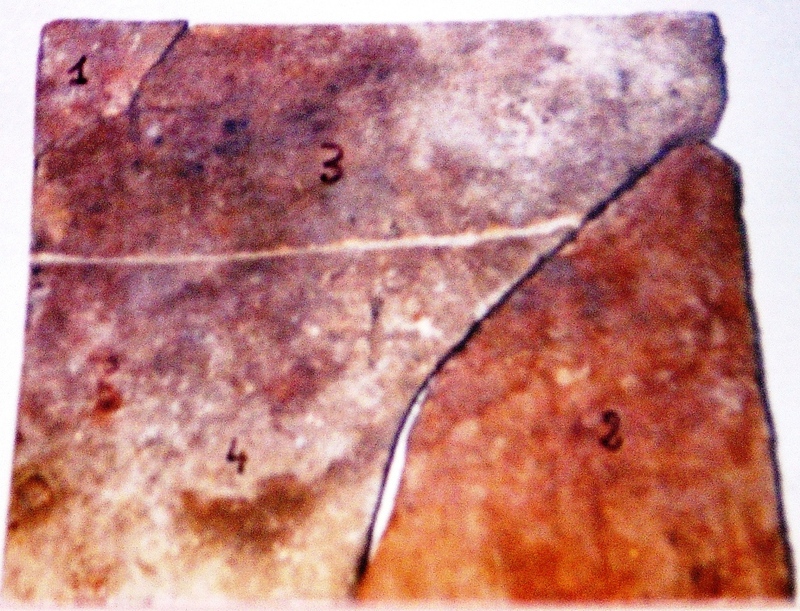 The only Mass rite known to St. Francis of Assisi (ca.1181-1265) and to the two French priests of the Laperouse Expedition and to all the Catholic clergy of the Roman Rite in 1788. The first two Masses were celebrated either on the day of the expedition’s arrival, Saturday 26th January, 1788 ,the feast of St. Polycarp or the next day which was Sexagesima. 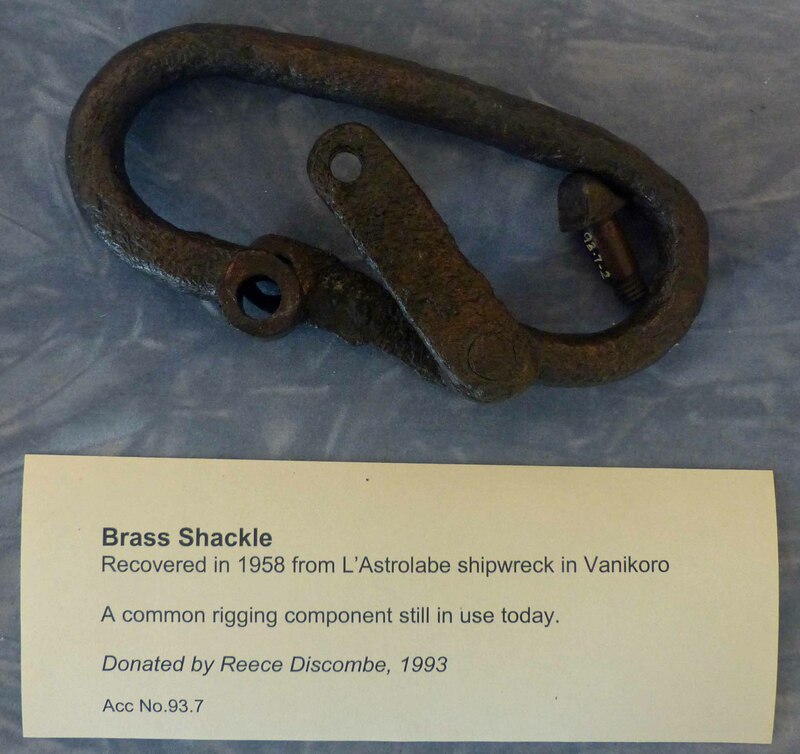 .Under the 1765 royal Ordonnance de la Marine, which specified the duties of all types of French naval personnel,,chaplains in the royal navy were obliged to say Mass on Sundays and feast days without exception unless bad weather prevented it and on other days as often as possible. 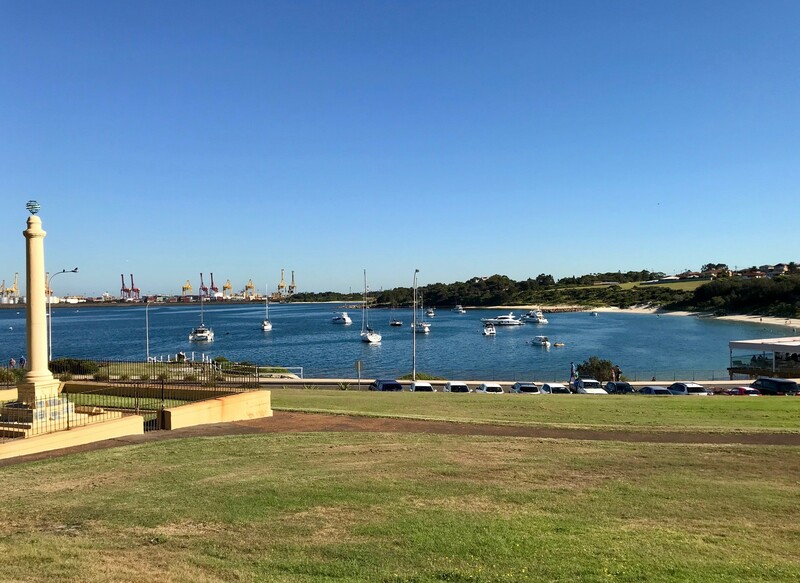 Here was the mandate for the introduction of the Mass to Australia in early 1788 which continued what had occurred throughout the Laperouse voyage aboard the two French frigates. The two priests did not concelebrate as concelebration of Mass by two or more priests did not exist in the 18th century on land or at sea. 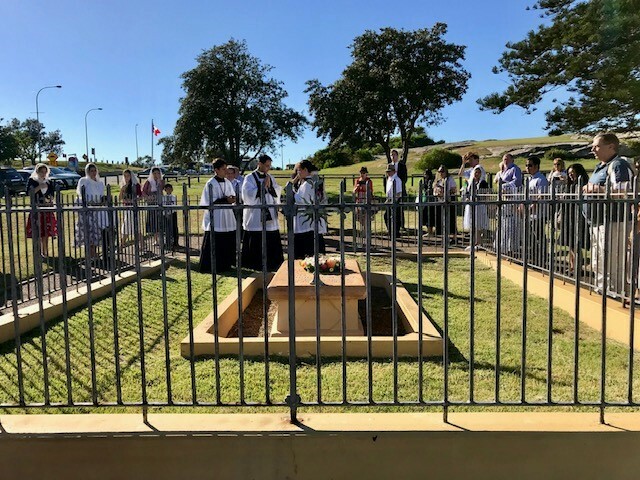 The Mass was introduced to Australia by two French scientific savants, a Conventual friar, whose death occasioned a Requiem Mass by his brother priest ,a canon of Ste. Genevieve in Paris and the Latin Office of the Dead which was mandatory at the funerals of naval personnel. 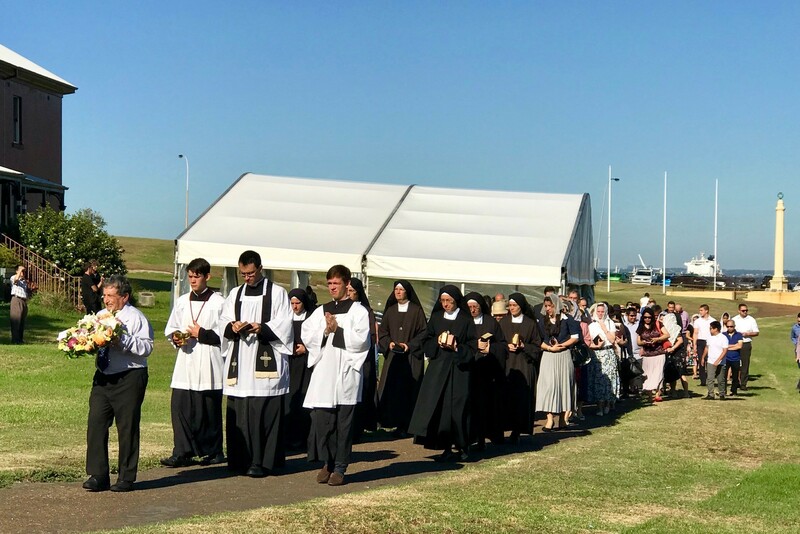 Over 130 attended the St Andrews Annual Receveur Mass celebrated last Sunday by Fr Paul Ghanem together with Fr Cauchi of Malabar Parish. 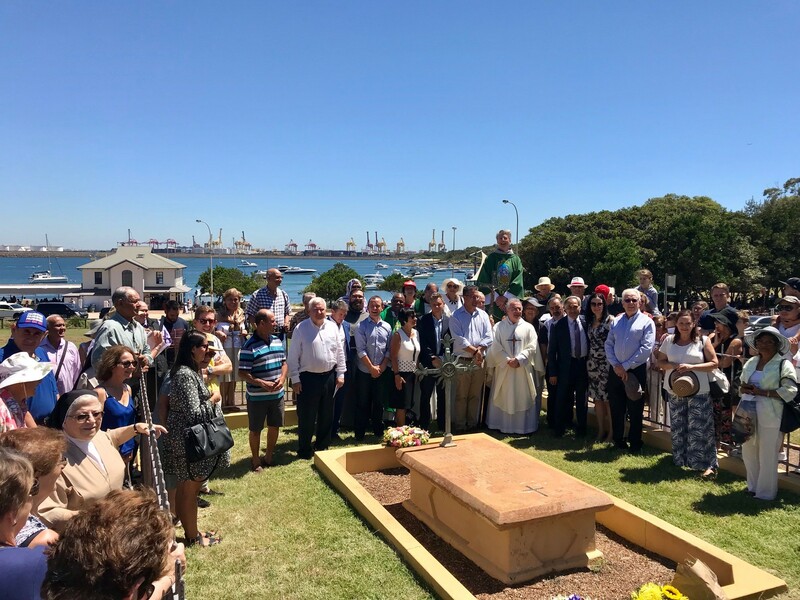 Fr Jan Chrzczonowicz (chaplain to the French speaking for the last 22 year for the metropolitan Sydney ) also was present con-celebrating at Mass and reading the Gospel in French as well as the prayers at the graveside. Fr Paul’s homily is published below. 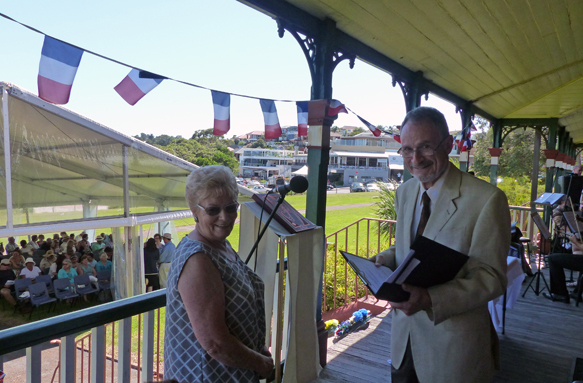 Randwick City Council generously sponsored the marquee and a Sausage Sizzle was provided by the Sydney Seaside Lions Club with drinks from Friends of the Laperouse Museum(FOLM). 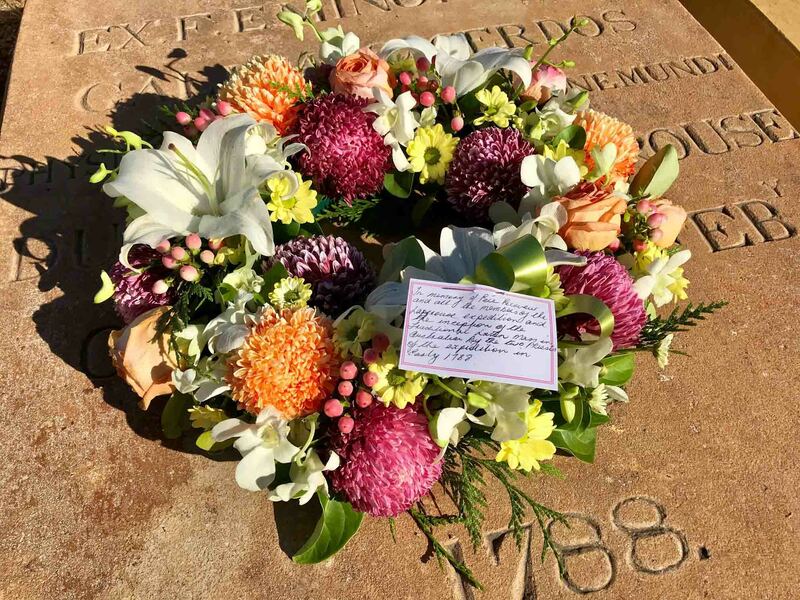 The Consul General for France, Nicolas Croizer and local Federal and State MPs Matt Thistlethwaite and Michael Daley and FOLM President, Carol Abela, laid wreaths. Councillors Carlos da Rocha and Danny Said represented Randwick City Council. 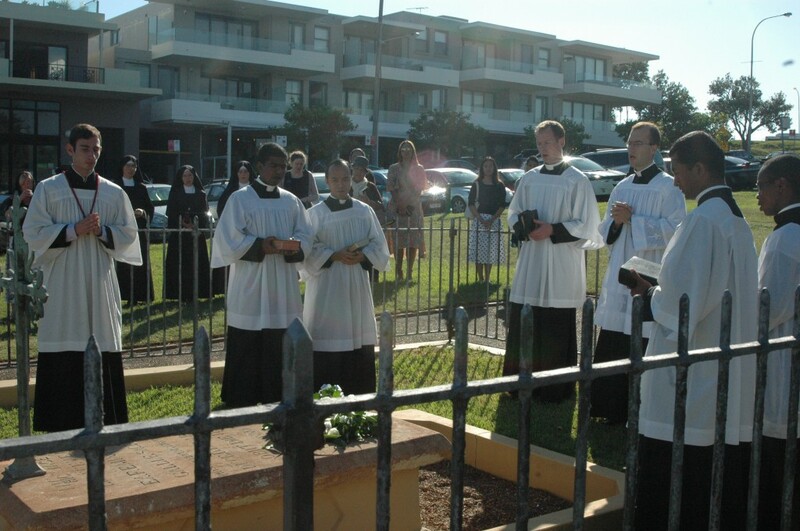 Members of Fr Pat Hurley’s congregation at Hoxton Park also attended. 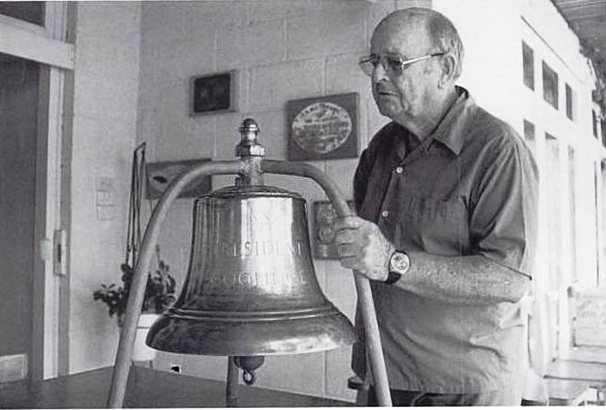 As the former priest at St Andrews, Fr Pat was responsible for the Mass from 1988 to 2002. 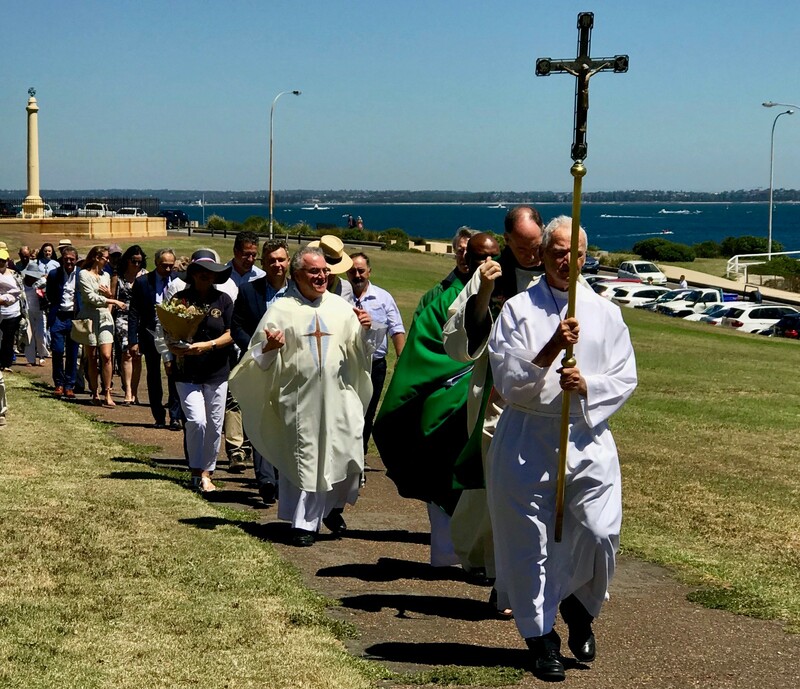 Photos below include Consul General, Nicolas Croizer with Fr Paul; Receveur Mass organiser Lee Leo with Fr Paul; Seaside Lions at work; the choir and violinist. 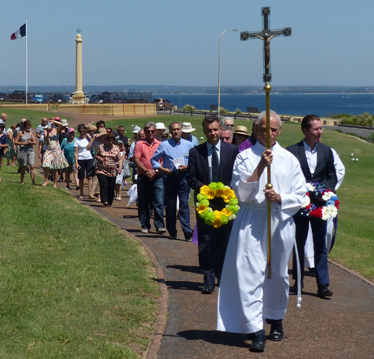 The Annual Receveur Mass, hosted by St Andrews, Malabar, will be held outside the La Perouse Museum commencing at 11am, 18th February 2018. Seating is available in a marque sponsored by Randwick City Council. 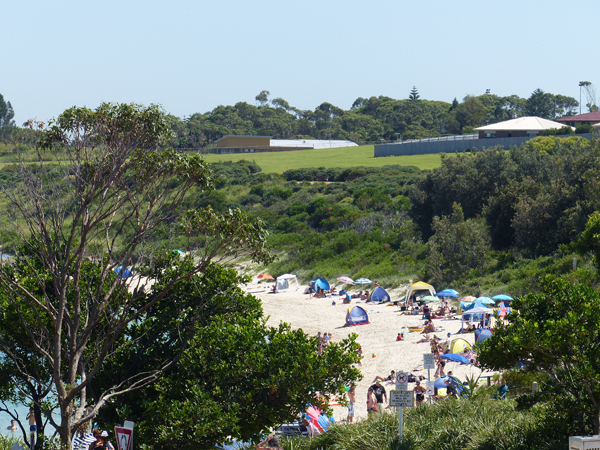 A sausage sizzle will be provided by the Lions Club. Over 120 attended the St Andrews Annual Receveur Mass celebrated today by Rev. 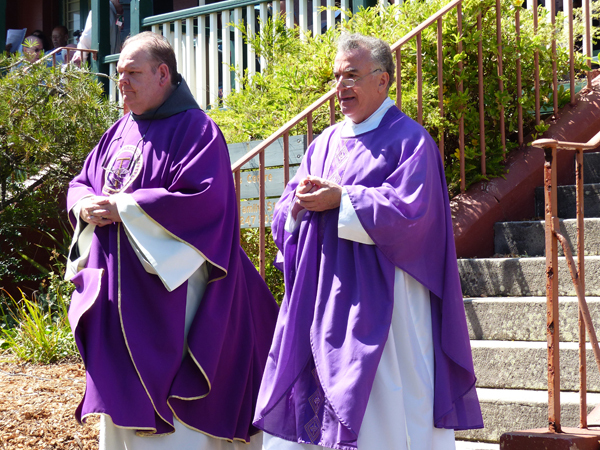 Dr Chris Shorrock from Melbourne and Fr Cauchi of Malabar Parish. Fr Shorrock reminded the gathering that today also celebrated Saint Valentine and was the 50th anniversary of the introduction of decimal currency. 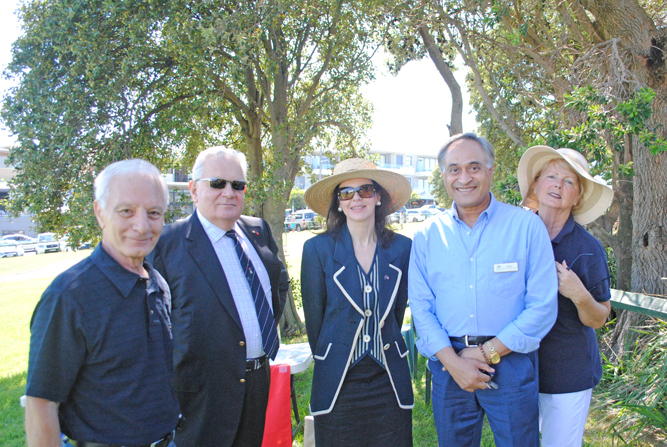 Randwick City Council generously sponsored the marquee and a Sausage Sizzle was provided by the Sydney Seaside Lions Club with drinks from Friends of the Laperouse Museum. 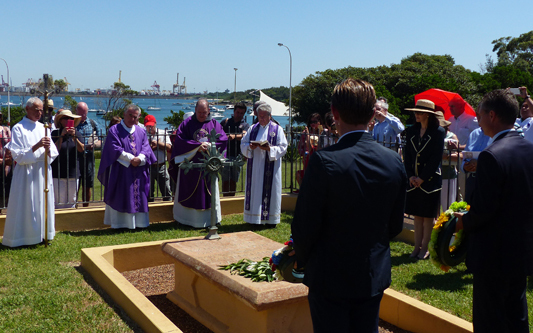 The Consul General for France, Nicolas Croizer and local MP Matt Thistlethwaite laid wreaths. 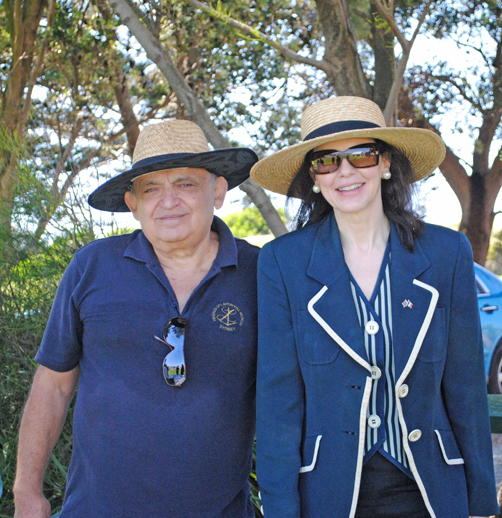 Also in attendance were the Mayor of Randwick Cr Noel D’Souza and the President of the Friends, Ms Nicole Forrest-Green. 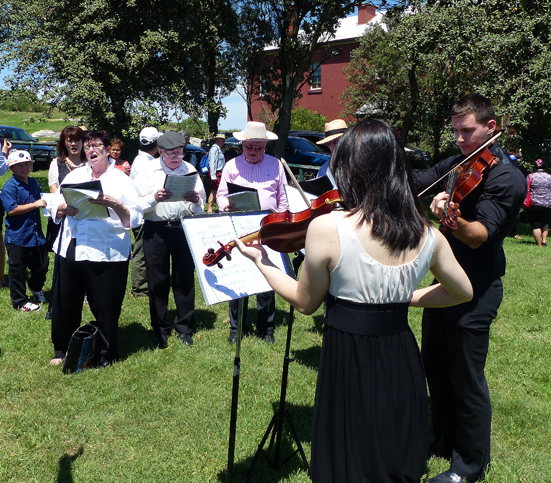 Sorely missed this year was Ms Trish Ryan, the longstanding coordinator of music. The 2016 PERE RECEVEUR COMMEMORATION, founded for 1988 and since annually continuous. 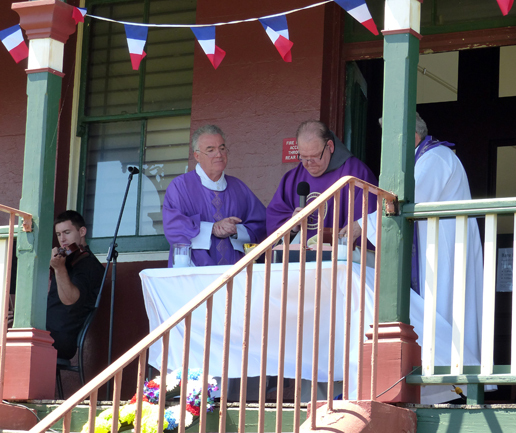 MASS IN THE TRADITIONAL LATIN RITE of the Catholic Church as celebrated separately by both priests of the Laperouse Expedition, Père Laurent Receveur and the Abbé Jean André Mongez at Botany Bay in early 1788. The first two Masses were said either on Saturday, 26th January, the Feast of St. Polycarp or Sexagesima, Sunday 27th January, 1788 in accordance with the duties of chaplains in the navy of the ancien régime as specified in a royal ordonnance of 1765. French seminar to the senior French class at PLC Pymble on the first Masses in Australia.